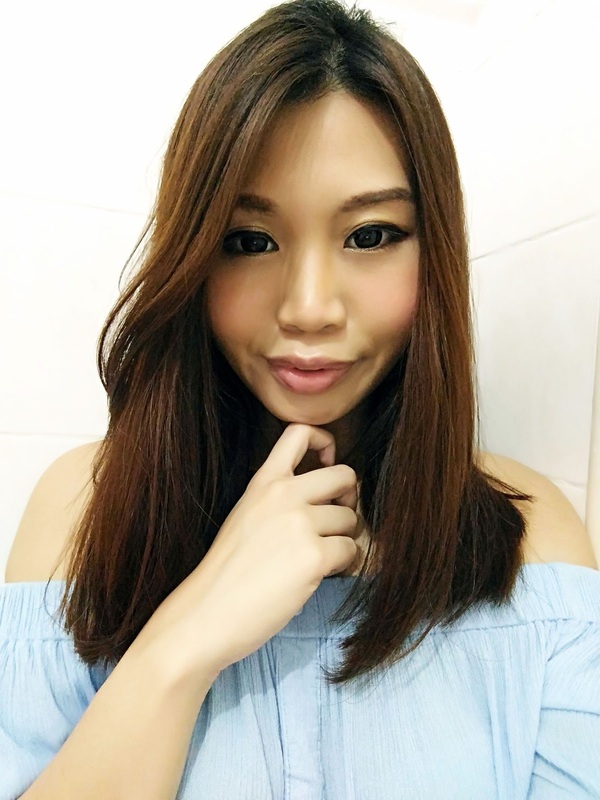 I was recently invited by Derma Dynamics to experience their Superfood Cell Glow Facial Therapy which gave me really good insight about my skin condition, how I should be taking care of my skin etc. But ultimately, the visible result of the therapy was what amazed me. The Superfood Cell Glow Facial Therapy is a powerful and highly effective facial therapy formulated exclusively to reactive even the laziest cells for optimal cellular function. The whole therapy involves 12 steps (including the skin analysis) and last about 2 hours odd. 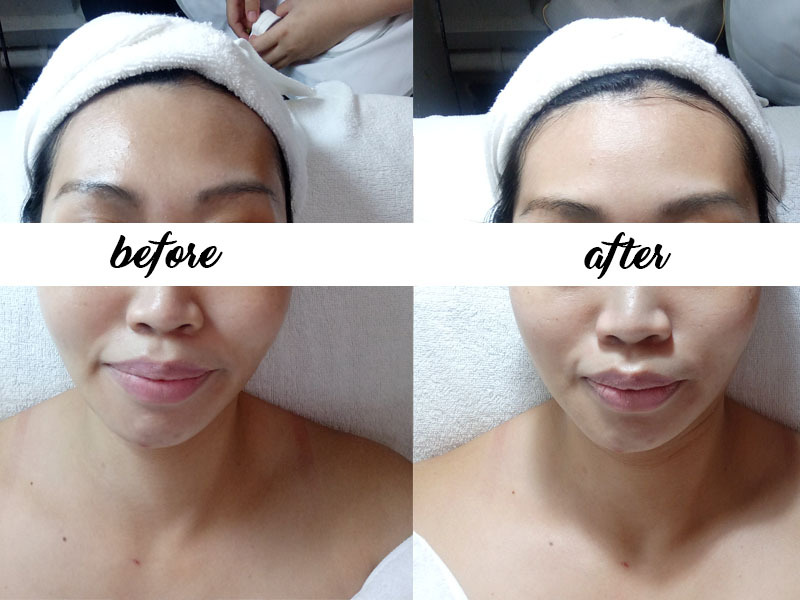 After I changed into their robe and got myself comfort on the therapy bed, Jean proceed to with step 2 - double cleansing; by thoroughly remove my make up and all the impurities on my skin before step 3 - exfoliation. 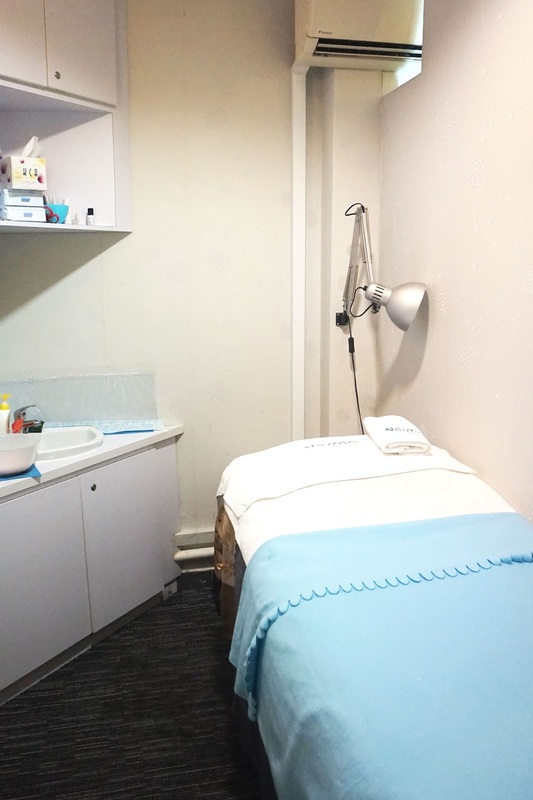 The exfoliation was done using customised scrubs that contained multi-vitamins. And immediately after the scrub, I observed a visible change whereby my skin tone was brighter, less oily and some of the tiny bumps seems to have disappeared too. Step 4 - steaming was for softening the skin for easier extraction. Step 5 - extraction, I was able to feel tiny stings here and there. Especially around the nose around. And due to the fact that I have oily skin, there were quite a handful of whiteheads hidden underneath my skin although on the surface my face looks pretty clean. After tolerating the slight pain of extraction for the sake of beauty, we proceed with step 6 - infusion of superfood and step 7 & 8 - application of rejuvenating facial & eye massage, and application of replenishing eye treatment. There are four types of superfood that you can choose from: Anti-ageing, brightening, oxygenating or hydrating. With my skin condition, I was offered the oxygenating and hydrating Superfood. The oxygenating helps to stimulate cellar growth of fibroblasts and optimise cell functions for a radiant glow whereas the hydrating helps to form a protective layer on the skin surface and improves the skin’s elasticity. Step 9 - Lymphatic drainage point massage. It was the most comfortable facial massage I had and Jean was really gentle with my skin. Step 10 - masking. 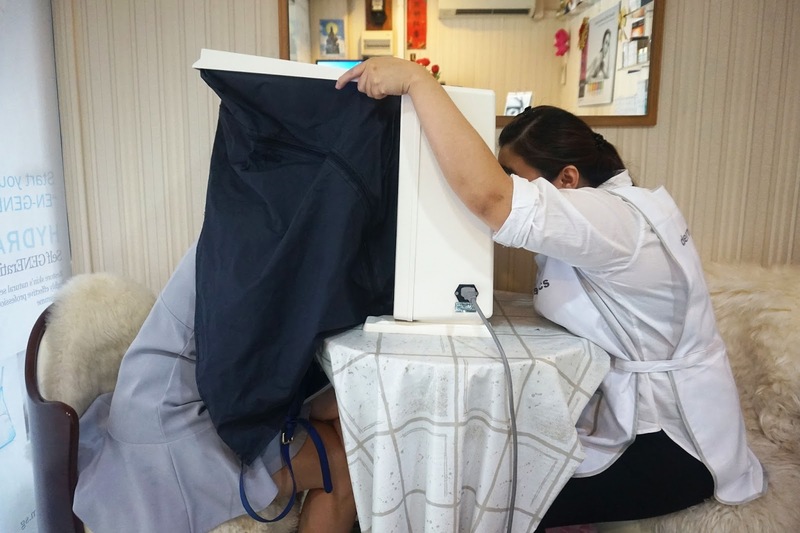 After the cooling massage, liquid mask was applied onto my skin and during the masking period, my leg was placed into a form of massage bag for the happy leg relaxing massage (step 11) which immediately made me fell asleep because it was that comfortable and relaxing. the massage uses a air pressure machine that accurately massage specific points of my feet, knee and thigh. This massage not only helps with blood circulation but also loosen knotted muscles, alleviates tired muscles and relieves water retention! The whole therapy comes to an end after the removal of the mask and application of moisturiser. 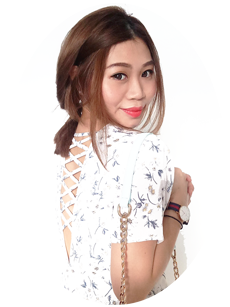 Although it was only just one session, I definitely notice a change in my skin tone and my skin was feeling more hydrated, supple and soft. Despite the long period of extraction, there was no sign of redness on my skin and it doesn't feel irritated neither. The whole session was enjoyable and effective. If you are interested to purchase the superfood, you could get it on the spot as well. Derma Dynamics carries both Sothys and Dermalogica products. Superfood Cell Glow Facial Trial at $50 only (worth $564). 12 steps Superfood Cell Glow Facial Therapy. #FREE Ageless Rejuvenating Facial and Eye Massage. #FREE Happy Leg Relaxing Massage. 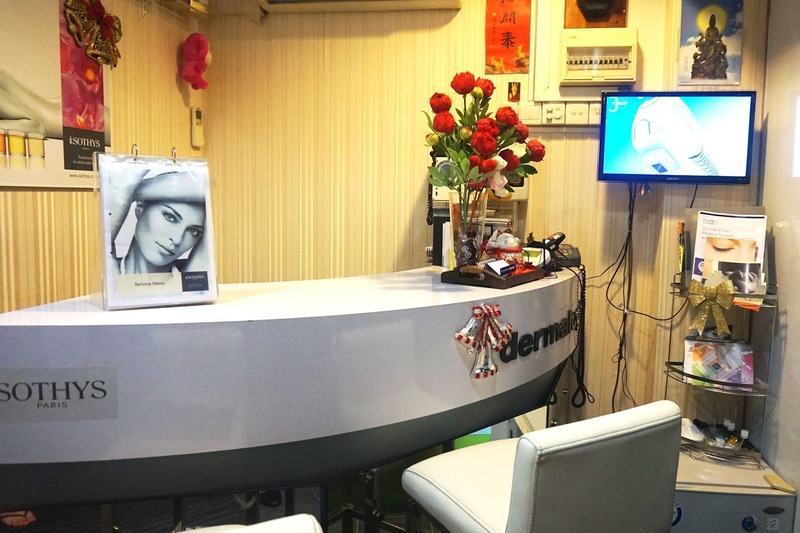 Book for your trial today@ http://dermadynamics.com.sg/facialpromotion. Terms and conditions apply.